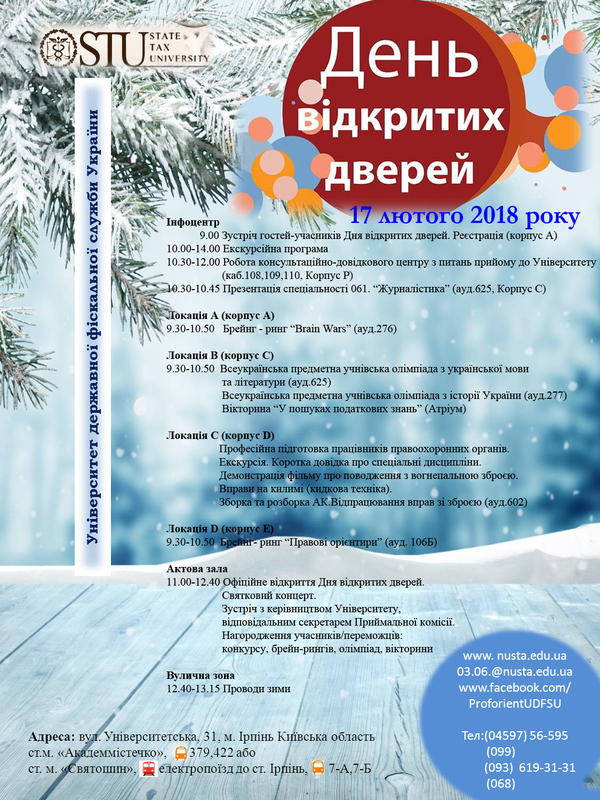 The University of the State Fiscal Service of Ukraine holds an Open House Day, which will be held on February 17, 2018. The University of the State Fiscal Service of Ukraine is located at the following address: Kyiv region, Irpin, street. University, 31. The institution carries out specialized training of specialists in the field of taxation and customs for the State Fiscal Service of Ukraine, law enforcement agencies and business entities for the first (Bachelor) and second (Master's) levels of higher education. Future university entrants for full-time and part-time study forms will have the opportunity to meet with the leadership of the University, ask questions and get an explanation of the specifics of the 2018 admission campaign.